Nite-Stic Eddie Brown will be celebrating his 21st Birthday with his extended family this year! Come celebrate with him on September 15, 2017. There will be free food while it last! You will see the New 4 County Champion Ash Aubry defend his title against Waylon Maze, X-James and Syde Effect! The Sinister Circle, Curtis Cash & Kris Nemesis in action. James Anthony and Everyones favorite, "The Undefeated One" Drew Thomas! Come get your picture with All the superstars and don't forget, FREE FOOD WHILE IT LAST! This is the Nite-Stic Birthday Bash, September 15, 2017! Good evening Ladies and Gentlemen to all those that were in attendance Saturday night. August 5, 2017 in Lumberton NC at the Priscilla King Arena you saw both Encore and Waylon Maze feet hit the floor at the same time, in the final moments of the Tag Team Title Battle Royal. Both James Hunter & Seth could not determine who's feet hit first and the match was considered a No Contest. I was not there to witness it but, as General Manager I was watching by live stream. I called an emergency meeting with the RWC board and we have decided that on Sept Sept 16th we are going to have a Tag Team Title Tournament to crown new champions. It will feature 8 Teams and there will be NEW TAG TEAM CHAMPIONS! You can't miss this weekend! Nite-Stic Eddie Brown Birthday Bash with free food while it last! Matches featuring the RWC Superstars and Pre show jam! 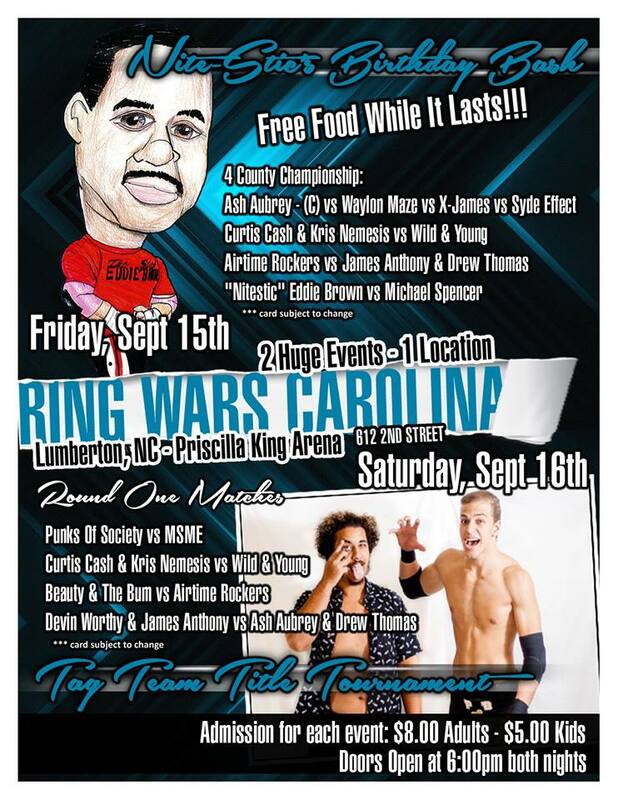 September 16, 2017 GM, Primetime has declared the 1st time, Priscilla King Tag Team Tournament. The best tag teams have been added to this event. You don't want to miss this weekend of fast-paced, action-packed, family entertainment! See you in Lumberton NC at the Priscilla King Arena @ 612 2nd street Lumberton NC!